Visualization of a NASA Voyager probe traveling through space. The historic Voyager 1 and Voyager 2 missions launched from NASA's Kennedy Space Center in Cape Canaveral, Florida in 1977. 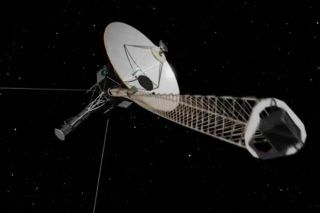 NASA and the California Institute of Technology (Caltech) are celebrating the 40th anniversary of the Voyager missions with multiple videos about the epic journeys of the two probes. Take a trip back in time with mission project managers and scientists as they reflect on the Voyager missions. Voyager project scientist and former director of NASA's Jet Propulsion Laboratory Ed Stone talks to the Caltech about the amazing discoveries made by the probes. NASA's Scientific Visualization Studio (SVS) created animated trajectories of the Voyager 1 and Voyager 2 probes from 1977 to 2017. Above is the Voyager 1 trajectory, while you can follow Voyager 2's path in the video below. Due to their mission trajectories, Voyager 2 actually launched before Voyager 1. It lifted off on Aug. 20, 1977 to make its famed "Grand Tour" of the outer planets. Voyager 1 launched on its own voyage on Sept. 5 of the same year. Follow Steve Spaleta on Twitter or Facebook. Follow us @Spacedotcom, Facebook or Google+.